Having made boxing history in 2018, by becoming the first man to hold all four world titles as a cruiserweight, unbeaten sensation Oleksandr Usyk is expected to make his move to the heavyweight division this year. 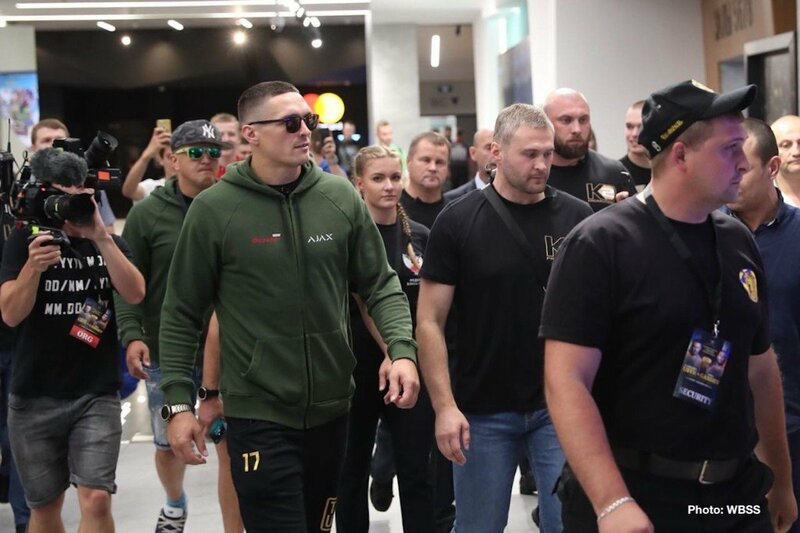 Fans are wondering if the unbeaten Ukrainian southpaw will be big enough to be able to overcome the absolute best at heavyweight and Usyk and his team are aiming to take a fight or two before going for the big guys of the division. Speculation is rife over just who Uysk, 16-0(12) might face in his heavyweight debut but according to a tweet from Michael Benson (as picked up by Give Me Sport), who reports what Usyk promoter Alex Krassyuk has planned, the unified cruiserweight king has a “70 percent chance” of facing either Alexander Povetkin or Luis Ortiz in his big-man debut. “Oleksandr Usyk’s K2 promoter Alex Krassyuk stated there is a 70 % chance Usyk’s next fight will be a heavyweight debut against either Alexander Povetkin or Luis Ortiz. He claims Jarrell Miller and Joseph Parker already turned down the fight,” reads the tweet in full. Usyk against either fellow southpaw Ortiz or former WBA heavyweight champ Povetkin would be most interesting and not at all an easy or safe move for Usyk in his heavyweight debut. Miller can be understood for turning the fight down, seeing how he is a major frontrunner to get a massive fight with Anthony Joshua in the spring if AJ makes his US debut then. But why would former WBO champ Parker turn his nose up at a fight with Usyk? Maybe the New Zealander feels such a fight would be a tough step for him? Ortiz makes sense, in as much as the Cuban cannot seem to get himself a big fight with any of the current heavyweights. But might Ortiz, as dangerous (if somewhat slow on his feet) as he is, be just a bit too risky for Usyk right now? Povetkin, pushing the age of 40 (although unofficially Ortiz may be older) and by no means a giant heavyweight, seems to be the ideal choice. Povetkin has vowed to fight on and the Russian feels he has more to offer despite his crushing KO loss to Joshua. Usyk Vs. Povetkin, or Uysk Vs. Ortiz some time in the first quarter of 2019? Interesting times for the heavyweight division. Next boxing news: Which Fight Would You Prefer To See Anthony Joshua Take In April: Dillian Whyte Or Jarrell Miller?